The first time I met Spc. Shane Parham, his face was wrinkled with sadness. Beads of sweat met Iraqi dust and curved down his sunburned skin like the swampy Alcovy River in his native Georgia. He was in the checkout line at Baghdad's Camp Striker commissary, only two months into his Iraq tour. But already, he'd witnessed war's brutality. I thought of that first meeting recently as I peered at Parham through a 2-inch thick slab of glass in a prison visitation booth. The cinder-block walls, drab like the Iraqi desert, closed in on him. Gone was his Army uniform. Instead, he wore tan prison garb, his hands bound in cuffs. His nails were long, his beard scraggly. He was not allowed to trim or shave for fear he might turn sharp instruments against himself, though he had once been chosen to man an M203 grenade launcher. Tears trickled out of his tired blue eyes, no longer bright and full of promise. He was a hero, honored by the governor of Georgia. Now the former sheriff's deputy was sharing quarters with thieves, addicts, even murderers. I'd met him in July 2005, in the midst of a raging insurgency in Iraq. He was a soldier's soldier, used to carrying loaded guns and wearing bulletproof vests. Brawny. Proud. Someone who hunted the game and fowl he put on the Sunday table. 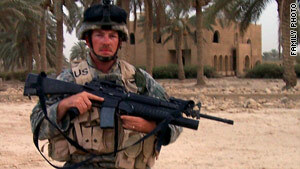 He'd arrived in Iraq ready to fight, heady with adrenaline. But now, four of his friends were dead. At first, he couldn't even talk about what had happened. But in time, he would unload his tale of loss, sitting in a tent with head in hands, struggling for words to describe the unspeakable. I knew it would be a long time before he healed. But neither of us could have predicted he would end up behind bars. His yearlong tour cut short by injury, Parham only served seven months in Iraq. But, as he learned, it's not the length of time at war that can change a man, but what he experiences. He came back to tiny Social Circle, Georgia, and tried to restart life, like the 2.2 million others who've returned from Iraq and Afghanistan. Of those, 43,000 came home without limbs or with other physical wounds, according to icasualties.org, which tracks combat deaths and injuries. One in five struggles on the inside. They come back scarred by hidden wounds, such as post-traumatic stress disorder and traumatic brain injury. They fight the war on a second front, in the cities and homes of America. A Department of Defense task force last year acknowledged the enormous physical and psychological demands placed on service members in two of America's longest-running wars. The group reported that more than 1,100 members of the armed forces took their own lives between 2005 and 2009, though it's not clear how many had been deployed. But the number represents an average of one suicide every 36 hours. There are no definitive statistics on how many soldiers wind up in court because of their troubles. But the anecdotal evidence is strong: From New York to California, from Colorado to Georgia, veterans of Afghanistan and Iraq have been charged with crimes as serious as murder.